I am not sure how to rate this book. I liked reading it and it was entertaining. But there are also some things I did not like. A few months ago I read “The Poison Artist”. Somehow I forgot to review it. I can’t explain why. I think I read it during our vacation and I tend to read books I do not necessarily have to review because I bought them myself. I liked “The Poison Artist”, it was unusual in many ways. The story was quite unique and dark. 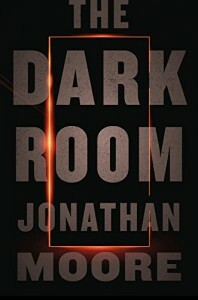 “The Dark Room” also has also a very dark story even it is not as unique. A beautiful young girl was murdered by bad men after they abused her. Nothing new here. An unexpected confession brings this cold case murder to Inspector Cain’s knowledge. He begins to investigate and slowly the background story reveals itself. The book is more of a slow burner. But the author managed to keep me interested even not much is happening. There is a lot of talking and police work. He is very precise when it is about describing surroundings and other details. But the dialogs are something different. There is a lot of talking but some things stay unsaid. Cain is the main character but we don’t know what he is really thinking. I felt excluded from some things or even from the story itself. Cain has a girlfriend. She experienced obviously some kind of trauma in her past because she can’t leave the house. This is irritating at first. I felt as if there was something I missed or there was another book I should have read so that I would know about the girlfriend’s problems. We learn later in the book a bit about it. But to me it seemed as if all the characters are only there because otherwise the story would not work. The author seemed not very interested in them. He writes precisely about the crime scenes, the autopsies. Every movement is worth some words, but there is almost nothing about how the characters look or at least what their problem is. Why, for example, is one of the female characters always stripping herself naked in front of Cain? She is troubled, obviously. But why is that so? Ok, at the end I got it. But there was a lack of depth to all the characters. I did not get them, really. You can see how everything happened, how one thing leads to another. But why – the motivation is not that important to the author. This book is very atmospheric, very dark and sinister. The writing is a mix of precise and imprecise. The main point here is the story and how Cain comes to the conclusion. I considered giving 4 stars because it was a quick read and entertaining on some level. But I had too much problems with the neglected character development. But I must also admit that this book is different. Maybe just because of its flaws. It is weird and strange and worth a look. I liked “The Poison Artist” better. It is similar atmospheric and dark but the story was more unique. I recieved an ARC from NetGalley in exchange for an honesr review.